Join the discussion on our forums! Come discuss Stampeding Roar over in our dedicated Stampeding Roar discussion topic. [x]The Gurubashi Arena has an extremely permissive policy on pets in the workplace. I mean, we do live in a meta where Druid basically gets to do whatever they want anyways. I love this idea! Definitely going to try and bring BIG Druid back with the new beast synergy. Not quite Baku, unless you discover either this or Baku due to cost restrictions. That's right! This is an even card, didn't see that. I stand corrected. Ironhide Direhorn works pretty well with this card. But presumably the best synergy will be with the upcoming Loa. A directly inefficient way to play Barnabus the Stomper. This card's not really that great. Yes, you can cheat out something at 7-10 mana - with the beast restriction - and that's fine... you have no shortage of excellent targets - but you're actually paying 6 mana to simply give a minion rush. This means your opponent can safely use up to 2 cards to answer it and not feel all that bad about it. Some good targets are: Giant Anaconda, Grizzled Guardian, Tyrantus, Charged Devilsaur, Oondasta, and probably the new druid legendary minions (although they haven't been spoiled yet as of this writing). I'd like to remind everyone that Rocket Boots exists, and with this card, you can give ANY minion rush and draw a card for 2 Mana, replacing itself. Obviously Rocket Boots has limits to how big you can go because it basically adds 2 mana to any minion to give it rush, but with Stampeding Roar, you're paying 4 more mana with no card replacement here, and unless you have a REALLY good justification for that self-inflicted card disadvantage, I don't really think you'd want to play this card, especially in arena. 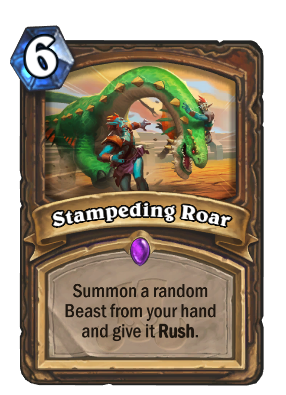 Stampeding Roar can be a good tempo card on exactly turn 4-6 (it's usefulness later in the game plummets as the game goes on), but once Ultimate Infestation is rotated out of standard and Nourish is sent to wild (it's going to happen sooner or later), the card disadvantage here is really going to hurt, especially since you're already taking card advantage losses by simply ramping in the first place. Also, many of the best targets are going away post-rotation as well... like almost all of them. I give this card like 3-3.5/5 stars now and 2/5 stars post rotation. Combo card for Ironhide Direhorn. Pretty good combo. This ain't a Powercreep on Eureka! because it removes the card from your hand. Very powerful effect; it's like a mini The Boomship that tutots! And the potential to drop Tyrantuswith rush on potentially turn 4 is nothing to scoff at. Also wonderful synergy with Ironhide Direhorn. Cheating out Charged Devilsaur would allow it to face. If there is a big beqst druid deck, this card makes it possible. Aha, I too like my 12/12s with rush and basically hexproof on 6 mana (cough, tyrantrus, cough). Not mention we can actually tutor the guy now with the beast tutor druid got. Fun times ahead. Oh lord... that's even better! Pretty iconic druid spell. Transformed into a card with keeping of it's orginal utility - speeding stuff up. I think it will be playable just not reallly good. Unless loa or champion will give some crazy idea.